Jacques-Yves Cousteau born June 11, 1910 in Saint-André-de-Cubzac, France - died June 25, 1997 in Paris was a French oceanographer, inventor, photographer, explorer, and environmentalist. Jacques Cousteau was an undersea explorer, a photographer, an inventor of diving devices and also a writer. Most important was his work that he produced and wrote for television, which enlightened audiences around the world on the subjects of the ocean's natural treasures and the effects of pollution. Jacques-Yves Cousteau was born June 11, 1910, in Saint-André-de-Cubzac, France, to Daniel and Elizabeth Cousteau. After their son's birth, the Cousteaus returned to Paris, France, where Daniel worked as a lawyer. Although Cousteau was a sickly child, who the doctors told not to participate in any strenuous activity, he learned to swim and soon developed a passionate love for the sea. He combined this love with an early interest in invention and built a model of a marine crane when he was eleven years old. In school Cousteau was bored and often misbehaved. He was even expelled at one time. In 1930 Cousteau entered France's naval academy, the Ecole Navale, in Brest. He graduated three years later and then entered the French navy. In 1936 he was given a pair of underwater goggles, the kind used by divers. Cousteau was so impressed with what he saw beneath the sea that he immediately set about designing a device that would allow humans to breath underwater. This project was put on hold during World War II (1939–45; a war in which England, the Soviet Union, and the United States clashed with Germany, Japan, and Italy). Cousteau became a gunnery (heavy guns) officer and was later awarded the prestigious Legion d'Honneur for his work with the French resistance, a military group fighting against the occupying German army. Even during the war Cousteau turned his attention to the world below the sea. In 1942 he designed the Aqua-Lung, an early underwater breathing device. Cousteau then helped remove mines from French seas left over from the war. One of these minesweepers (boats used to remove mines from the bottom of the ocean) would become Cousteau's research ship, the Calypso. On the Calypso 's first research voyage to the Red Sea, the maritime (having to do with sea travel) and diving expertise of her crew was combined with the scientific expertise of academic scientists who came aboard. These expeditions advanced knowledge of the deep by gathering underwater flora (plants) and fauna (animals) and by extensively photographing the underwater world, which is more vast than the surface above water. When the French Ministry of Education finally provided grants to cover two-thirds of the expenses, Cousteau resigned from the navy in 1957, with the rank of lieutenant commander, to become director of the Oceanographic Museum in Monaco. In 1960 Cousteau was an important part of the movement to prevent the dumping of French atomic waste into the Mediterranean Sea. This movement ended in success. 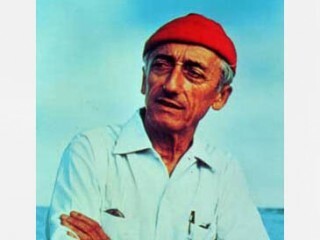 Throughout his life Cousteau enjoyed much recognition for his tireless support of ocean ecology (the relationship between organisms and their environment). In 1959 he addressed the first World Oceanic Congress, an event that received widespread coverage and led to his appearance on the cover of Time magazine on March 28, 1960. In April of 1961 Cousteau was awarded the National Geographic 's Gold Medal at a White House ceremony hosted by President John F. Kennedy (1917–1963). It was through Cousteau's television programs, however, that his work captured the imagination of a worldwide audience. In 1966 Cousteau's first hourlong television special, "The World of Jacques-Yves Cousteau," was broadcast. It was well received by critics. The program's high ratings were important in landing Cousteau a contract with the American Broadcasting Company (ABC), which resulted in the series "The Undersea World of Jacques Cousteau" in 1968. The program ran for eight seasons and starred Cousteau, his sons, Philippe and Jean-Michel, and sea creatures from around the globe. In order to raise public opinion against pollution, in 1975 he founded the Cousteau Society, an international organization with branches in several countries (including the United States at Norfolk, Virginia). In honor of his achievements, Cousteau received the U.S. Presidential Medal of Freedom in 1985. In 1987 he was inducted into the Television Academy's Hall of Fame, and later received the founder's award from the International Council of the National Academy of Television Arts and Sciences. In 1988 the National Geographic Society honored him with its Centennial Award, and in 1989 France admitted him membership in its prestigious Academy. Cousteau died in Paris, France, on June 25, 1997, at the age of eighty-seven. While some critics have challenged his scientific credentials, Cousteau never claimed "expert status" in any discipline. But perhaps to a greater degree than any of his fellow scientists, Cousteau enlightened the public by exposing the irreversible effects of environmental destruction. View the full website biography of Jacques-Yves Cousteau (En. ).